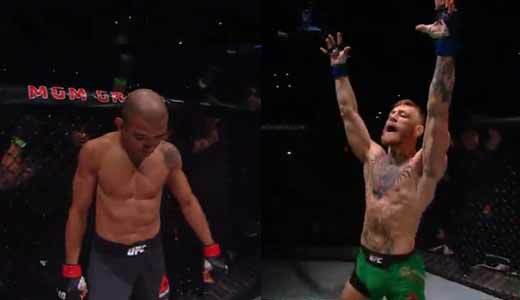 Review by AllTheBestFights.com: 2015-12-12, one of the most anticipated Ufc fights ever ended with a spectacular and unexpected finish: Jose Aldo vs Conor McGregor will go down in mma history and it gets four stars as one of the most exciting mma fights of the year 2015 (UFC Performance of the Night). The black belt in Brazilian jiu-jitsu and Ufc Fw champion Jose Aldo entered this fight with a professional mma record of 25-1-0 (64% finishing rate) and he is ranked as the No.1 featherweight in the world. ‘Scarface’ Aldo suffered his only loss in 2005 when he faced Luciano Azevedo, since then he has collected 18 consecutive victories winning the Wec Fw title in 2009 (against Mike Brown), then promoted to Ufc champion in 2010. He fought twice last year beating Ricardo Lamas (=Aldo vs Lamas) and Chad Mendes (=Aldo vs Mendes 2). His opponent, the interim Ufc Fw champion Conor McGregor, has an official record of 18-2-0 (94% finishing rate) and he entered as the No.3 in the same weight class. ‘The Notorius’ McGregor suffered his last defeat in 2010 when he faced Joseph Duffy, but since then he has won 14 fights (six in the Ufc) beating Dennis Siver (=McGregor vs Siver) and Chad Mendes in 2015 (=Mendes vs McGregor). 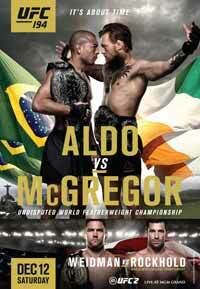 ‘Junior’ Aldo vs McGregor, main event of the UFC 194, is valid for the Ufc featherweight title. Watch the video and rate this fight!